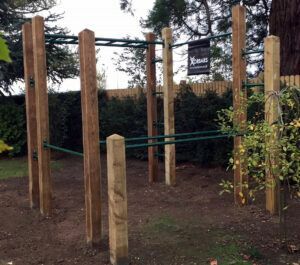 The following case study looks at the Ghavi family and the installation of their new Xorbars outdoor gym. Our case studies are designed to help you find your perfect garden gym. A lovely family base in Oxford, Dad and Mum early 40’s and two energetic girls aged 7 and 5, were looking for a set up the would work for them all! and due to their new found love of climbing so much, the parents felt that they wanted something to keep them climbing now that scaffolding had gone. Through various conversations with ourselves here at Xorbars, the family wanted something that they could all use on all year round, a home gym for all ages where they could train and have fun with family and friends. Mum and dad started off designing their own gym, looking at lots of different options, but by the end of the design process they decided that the Warrior Gym had everything they required and was the one to go for. The gym was installed at 2.40 metres which is the general height that most people opt for. This was so dad being the tallest (5ft 11) had to do a little jump to reach the monkey bars. There were some additions to the Warrior Gym, mum and dad opted to have 4 ladder bars on one side of the monkey bar, this is ideal for smaller children aged 5 to 6. For older kids then usually 3 ladders bars are sufficient. Two were also added to the other side so that the kids could climb down but also so that dad could look at training to do the human flag. On the day of installation the children are given 5 minutes to see how it feels. Then they have to leave it for 2to 3 days. Both of the girls were so excited to get to use the gym, and they loved it! They flowed easily from each section of the Warrior set up, in fact the five year old girl could swing on the monkey bars and miss out every other rung which was impressive. Big smiles all round, happy children and parents really pleased with the end result. 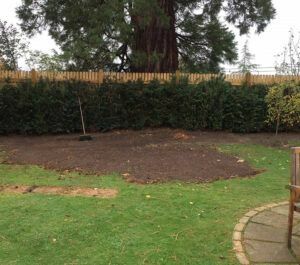 The duration of the installation took 2 days, it was a harder than a usual installation because the roots off the large redwood pine tree (which was sited behind the set up) caused a lot of trouble. But the customer achieved the look they wanted as the gym blending in perfectly with the garden. The previous equipment the children had in the garden was a freestanding metal climbing frame, but this had become unstable and also too low for them now. As the installer left the premises he could hear the girls busily arranging for all their friends to come over 3 days after the installation to show them their new and exciting gym.